CM Magazine: The Thing I Say I Saw Last Night. The Thing I Say I Saw Last Night: A Christmas Story. Wendy McKernan. Illustrated by Izabela Bzymek. Vancouver, BC: Little Dragon Publishing, 2011. 32 pp., pbk. & hc., $12.95 (pbk. ), $19.95 (hc.). ISBN 978-0-9855204-1-6 (pbk. ), ISBN 978-0-9855204-0-9 (hc.). "I first heard a crash, next a bang and a boom. Then I heard footsteps right next to my room. Felt a chill up my spine as a shadow drew near. Whatever was coming, it soon would be here." Did it wail or shriek? Did you hide in the closet? Did you take a peek?" Stories told in verse fall into two categories: those that flow well and sound natural and those that don't. Fortunately, this one falls into the former category. The rhythm is satisfying throughout and gives the story a sense of momentum as the plot advances. This story is based on a brother/sister relationship in which the older brother recounts a frightening story to his younger sister. The mood is somewhat scary as he describes an intruder that came into their house last night. At first, the brother's description seems to be that of a monster, but, as he goes on, there are more clues given that cause readers to revise their mental image. Just as his sister has jumped out of her bed in fear, her brother reveals that it wasn't really a monster at all. In fact, it was Santa Claus delivering Christmas presents. Here, the author's word choice relies on some key words and phrases from the classic "T'was the Night Before Christmas". In the brother's retelling, he was not only able to see Santa but managed to catch him and tie him up. The story comes to a rather abrupt end at this point. An interesting feature of this book is the way the story is displayed on the page. Most of the pages are dark and gloomy which represents the brother's story about the previous night. On many pages, a light coloured portion of the page shows the sister's reaction to the story and contains the sister's dialogue. In the sister's portion of the story, readers can see her becoming more and more worried until she realizes that her brother is playing a trick on her. Finally she understands that he has been misleading her, and she stands with her hands on hips in annoyance. Facial expressions on the two main characters clearly show the effect that the siblings are having on each other as the story progresses. One problem with the book is that the "surprise" ending to the boy's story is a little too predictable based on the book's subtitle: A Christmas Story. 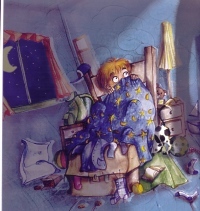 The cover illustration may lead many readers to guess who the intruder is a little too early on in the story. Also, the characters are never named, not even in passing, and this makes readers feel a little disconnected from them. Nevertheless, the story within a story is clever, and the rhymes are well executed. 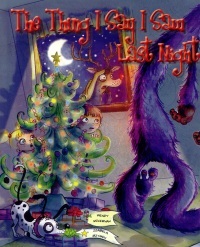 Nothing can replace "T'was the Night Before Christmas", but this book offers a different perspective that is sure to make readers chuckle. Claire Perrin is an elementary teacher-librarian with the Toronto District School Board.